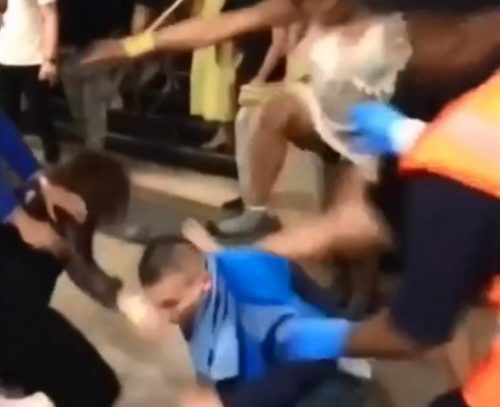 A brutal video of four women – three of whom are transgender – beating up a man has emerged after they pleaded guilty to violent disorder. The attack took place on June 24 at around 2 a.m. in the Leicester Square subway station in London. Prosecutors said that the victim made a “minor provocation,” while Gay Star News reports that it was a slur that may or may not have been transphobic. Tylah-Jo Bryan (22), Tamzin Lush (27), Amarnih Lewis-Daniel (22), and Hannah Bryan (22), who were drunk at the time, can be seen in video of the attack stomping and kicking the victim while he’s lying on the ground. People in the crowd started chanting “Fight! Fight! Fight!” while Transport for London attempt to stop the attack. The man was left with a black eye and cuts. Prosecutor Julian Pozimski called the attack “severe violence” and the magistrate agreed. “This offense is so serious that we feel it needs to be sent up to the crown court,” said Westminster magistrate Kirsty Walker. The four are currently awaiting sentencing.